The Evanston Township High School in suburban Chicago fundraised to save a popular arts centre by blasting out the song ‘Baby’ by the sworn enemy of melodies, Justin Bieber. Passing students were only able to stop the onslaught by donating. Amnesty International was quick to condemn the fundraiser. 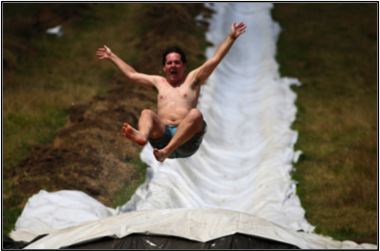 Two fun-loving Kiwis, Jimi Hunt and Dan Drupsteen, devised a fundraising campaign that consisted of constructing the world’s biggest water slide in Auckland. The fundraiser and its 650 metre slippery shoot raised funds and awareness for those battling depression, during a two-day festival in February 2013. In 2009, upon launching the Uniform project, Sheena Matheiken pledged to wear the same black dress every day for an entire year. She raised over $100,000 in donations for the Akanksha Foundation. Several men around the world have repeated such a fundraising campaign, focusing on wearing the same clothes for a year, albeit without raising funds for charity. Australian Nick Le Soeuf spent three weeks locked behind a shop facade with three hundred poisonous spiders to raise funds for Variety, a children’s charity. His previous fundraising campaigns have included stints in a snake pit and a shark tank. He is no long particularly fussy about where he goes on holiday. Star Wars enthusiast, Jacob French, walked 5,000km across Australia dressed as a Stormtrooper in aid of the Starlight Children’s Foundation, which fundraises for entertainment, education and family outings for sick children. 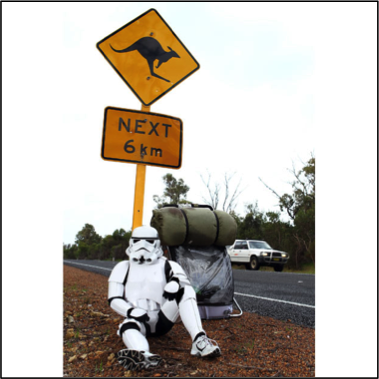 Fellow travellers in the bush were relieved to find out that they hadn’t hallucinated a stormtrooper as a result of weariness. Now such lengths are not required because Shareagift makes fundraising easy and seamless!